Could adding composting services be beneficial for your business? 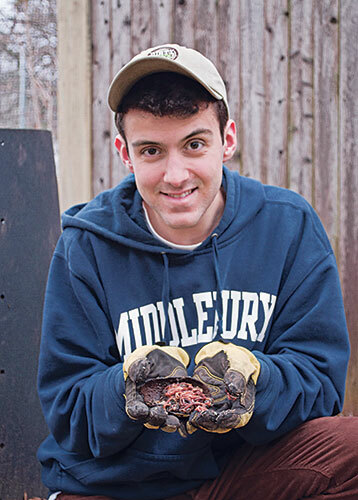 Grant Berman’s service includes red wiggler worms he grows in his parents’ basement. It all started with two high school sophomores who wanted to ensure they could work together during the summer before their junior year. Uncertain that a job at a local business would allow them to remain a team, pals Grant Berman and Max Mackenzie of Newton, Mass., decided to start their own business. That was nearly three years ago. Today, their venture, Dirty Boys Composting, continues to grow. In fact, Berman, who is now sole owner, took a gap semester prior to his entrance to Middlebury College so he could work on the company before starting school in February. With 130 clients, Berman has hired several friends part-time to do some of the “hands-on work,” and he is now focused on managing the business. When the duo started Dirty Boys Composting, they didn’t have any special knowledge of composting. They simply noticed there was a lot of interest in it among members of their community—and not a lot of know-how. So, the two set out to learn everything they could about how to do it. Once they had fine-tuned the composting process on their own, they began offering services to their neighbors, including installing, evaluating and maintaining backyard compost piles. There was little upfront investment in the business; it’s primarily based upon Berman’s knowledge, trial and error, and a willingness to get dirty. 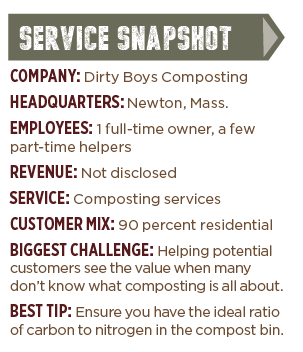 Dirty Boys has two primary packages: an “already composting” service for clients who have done some of the work already or a “starter” service in which Dirty Boys gets a new compost pile up and running. The services are sold on an annual subscription basis for $105 or $160, respectively. For clients who need to get started, the first step is having a compost bin. Berman purchases the compost bins from his town’s city hall for $50 and sells them at cost to his clients. One add-on Dirty Boys offers is a one-time compost pile screening service, which starts at $55. This offering entails sifting out both materials that haven’t decomposed yet (these are retained to build the client’s next pile) and garbage (rubber bands, plastic bags and more). The ready-to-use screened compost is stored in 5-pound buckets, which Berman obtains from local bakeries. He cleans them out and brands them with his company’s logo before reusing them. Berman—who says he’s not a gardener but an environmentalist—would like to make composting as commonplace as recycling. Still, he says there is no denying the great benefit that composting has on the health of soil and plants—which is why the service could do well for a landscape business. Though most customers recognize the benefits of composting, Berman says they often have a difficult time keeping up with it—many lose their gusto over the winter. But with Dirty Boys’ help, Berman has helped make it doable for many customers. “There’s interest in composting but not a lot of support. I think that’s what helped us to be successful right off the bat,” Berman says. While the lack of knowledge about composting is one reason Dirty Boys has gotten off the ground, it also makes it difficult for him to communicate his service offerings. He’s combatting that challenge by marketing at farmers’ markets, town fairs and doing speaking engagements at garden clubs, nurseries and libraries. “Word of mouth is big, and it has been helpful that I’ve been quoted in The Boston Globe, was on TV and in the town newspaper,” he says. He also gets the word out through local parent-teacher organization email newsletters and his own e-newsletter. He plans to redirect his marketing efforts towards social media; it’s something he can tackle from his dorm room.